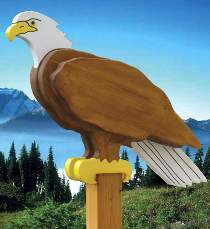 The mighty eagle, the symbol of America, perched on your porch or in your yard. He stands guard like a sentinel watching over your house and family. Standing an imposing 20" tall, 36"L and 7-1/2"W, his size can be compared to a real life adult eagle. The project is constructed in seven layers, each piece can be cut from "2x12" stock. This realistic, three-dimensional project is actually very easy to cut from the FULL SIZE patterns which are all included in the project plan. Designed to mount on a short length of "4x4" post which can be attached to your deck railing or a longer length of "4x4" post standing by itself in your lawn.